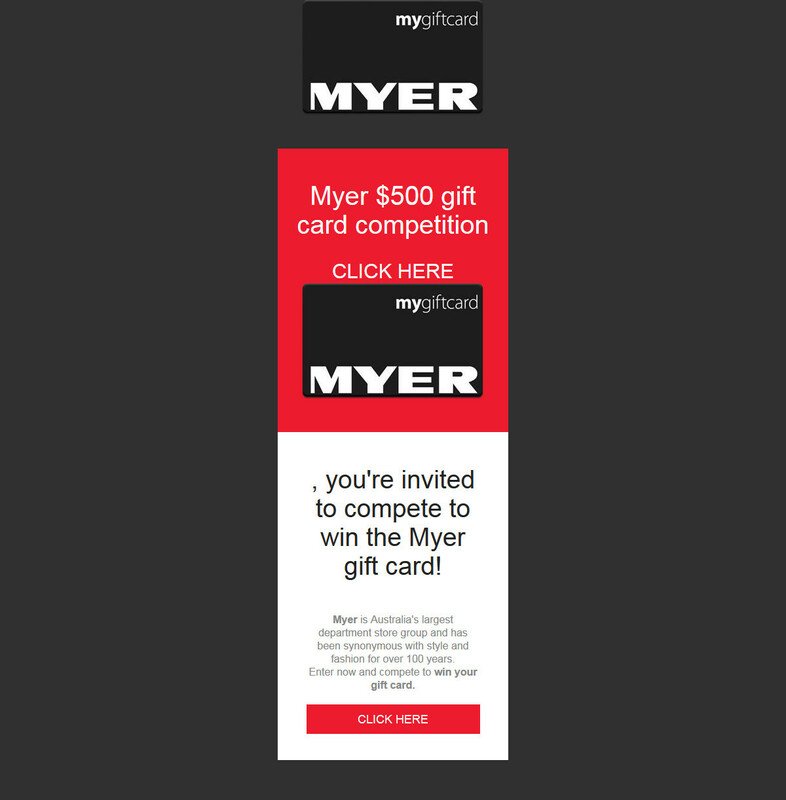 A malicious gift card competition scam email has been caught by MailShark spam filters claiming you can win a Myer gift card. Myer is a mid-upmarket Australian department store chain with a broad range of products both online and in-store. Keep reading to find out more about this particular gift card email scam attempt and delete it from your inbox if received. Figure A is a copy of the email in question. It is well branded however, a clear indication of its true nature is the prompts to ‘click here’ throughout the email. 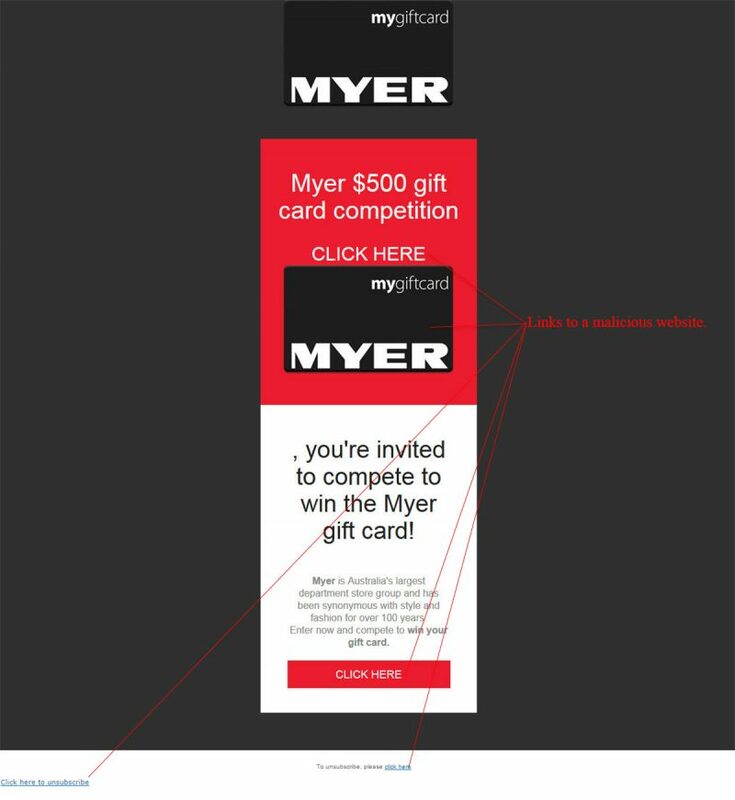 The subject simply reads “Myer Giftcard” and the sender is shown as “Meyer”; the poor spelling and unrelated email address to the official Myer website are more evidence against this malicious email. There are several dangerous links which can clearly be seen in Figure A – you can check their destination URL by hovering over them without clicking. Be careful, as even the unsubscribe links are malicious as a last attempt to catch you off guard. Figure B is a safely captured screenshot of the website you will land on if any of the links within the email are clicked. It is extremely similar to the email’s contents and again, pushes you to click through, which this time will lead to a malware infection. Delete this email from your inbox to avoid falling for it. #Gift card scams are constantly circulating and some are more convincing than others. If ever in any doubt, you can always visit the website homepage of the vendor in question where they will likely have details of any legitimate vouchers or gift cards they’re currently running. We are yet to hear of a legitimate gift card being awarded from these scams so please, if you receive anything of similar nature delete it from your inbox straight away!